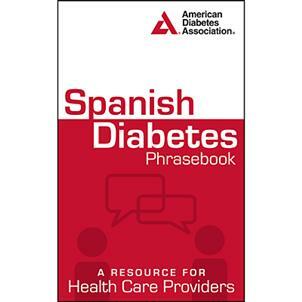 Spanish translations of common phrases for diabetes care. Help Spanish-speaking patients with diabetes management. With more and more physicians, clinicians, educators, and administrators working with Latino and Hispanic patients, ensuring accurate communication is more important than ever. This handy pocket reference offers the Spanish equivalents to common phrases you use every day. From patient introductions to medical histories, examinations, and follow-up, you can provide a more trusting environment and quality care by engaging patients directly. Phrases are divided into nine natural groups for ease of use. A glossary of related terms is included. Provides accurate communication is critical in all aspects of medical diagnosis, education, and general diabetes care. Helps you communicate more effectively with your Spanish-speaking patients. Written by the experts at the American Diabetes Association®, the nation's leading voluntary health organization supporting diabetes research, information, and advocacy and the leading publisher of comprehensive diabetes information.